Apple Mobile Smartphone Device iPhone 4S will be available in the Philippines through Globe Plans on December 16. 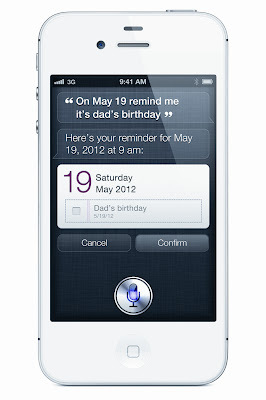 Apple's iPhone 4S is the first iPhone to officially launch with the SIRI Natural language commands and dictation. This cool feature of a mobile device will let iPhone 4S users to do voice command on the their iPhone for smartphone common tasks like calling someone from your Phone book or read incoming SMS for you. Globe announces its launch which is paired with Globe plans according to the users preference of usage. iPhone 4S is equipped with a Dual-core 1 GHz Cortex-A9 Processor with the latest Apple OS release iOS 5. As early as the start of December 2011, Globe is already accepting iPhone 4S Pre-orders online for new iPhone users or those old iPhone users who plans to upgrade to the latest iPhone release. To place your orders for Globe Plan bundled iPhone 4S just log on to http://iphone4s.globe.com.ph now. iPhone 4S release is the most latest of all the iPhone release yet with the following main features: Dual-core A5 chip, New 8MP Camera with PowerVR SGX543MP2 GPU, iOS 5, iCloud and the game-changing feature of iPhone 4S is SIRI. Some of the Apple Mobile Devices that also be available through Globe Plans are Apple iPad, Apple iPhone 3G and Apple iPhone 4. Apple iPhone 4S through Globe affordable Plans posted at Cebu Events Blog. 0 comments: on "Apple iPhone 4S will be available on December 16 through Globe Plans"